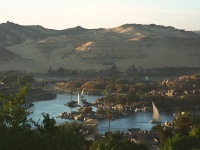 The Nile River has been the lifeblood of Egypt for thousands of years. The narrow fertile strip of green on either side of the river lies in stark contrast to the arid desert plains beyond. Although the flow of this iconic river is now controlled by the Aswan Dam, the annual flooding of the Nile was the real wealth of Ancient Egypt, creating the breadbasket that allowed these complex ancient cultures to develop. Every year the flooding Nile deposited rich silt on the river banks, and this layering of silt has preserved levels of archaeological remains from previous settlements that have been discovered underneath almost every town and village in the valley. Excavations have revealed thousands of tombs, temples and monuments along the banks of the river, and the best places to explore some of these relics are the historic towns of Luxor and Aswan. Cruises along the mighty Nile River are very popular. Tourists can visit the numerous ancient attractions along the banks and watch as rural Egyptian life slowly passes them by. The sunsets on the river are legendary. Popular sightseeing stops include the magnificent Abu Simbel temples, built by Ramses II, the Temple of Karnak - still the largest temple complex in the world - and the famous Valley of the Kings. Visitors who aren't keen on a river cruise can easily travel on their own steam to all these incredible places in the Nile Valley.